There is something about downtown areas. It may be the architecture or the bustling atmosphere of anonymity, but cities just provide a great place to watch the world. It is the variety of people I watch wandering around, and the worldly accomplishments we display to millions of people through our buildings- higher and higher, cooler and cooler. Anyway -moving away from Philosophy 101- I took a mini vacation to Los Angeles yesterday. 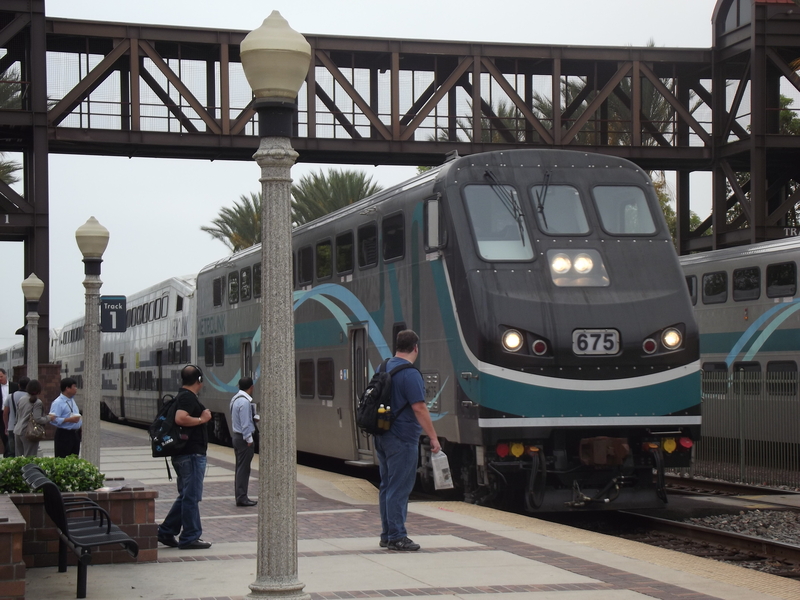 I hopped on the Metrolink to go to Los Angeles Union Station from the Fullerton train station. It was a Monday with June gloom cloud cover in the morning and sunny, 80s temperature in the afternoon. Luckily I wore a hat because it got hot! Even though I live 30 miles south of Los Angeles, I hardly ever make it out to the city. This was only my second time journeying through downtown. L.A. Union Station, with its old-time, regal 1930s feel, it absolutely amazing. I walked over to Olvera Street, a historic Mexican cultural district. It was empty at 9:30 a.m. but was busy, with mariachi music playing, when I came back in the afternoon. 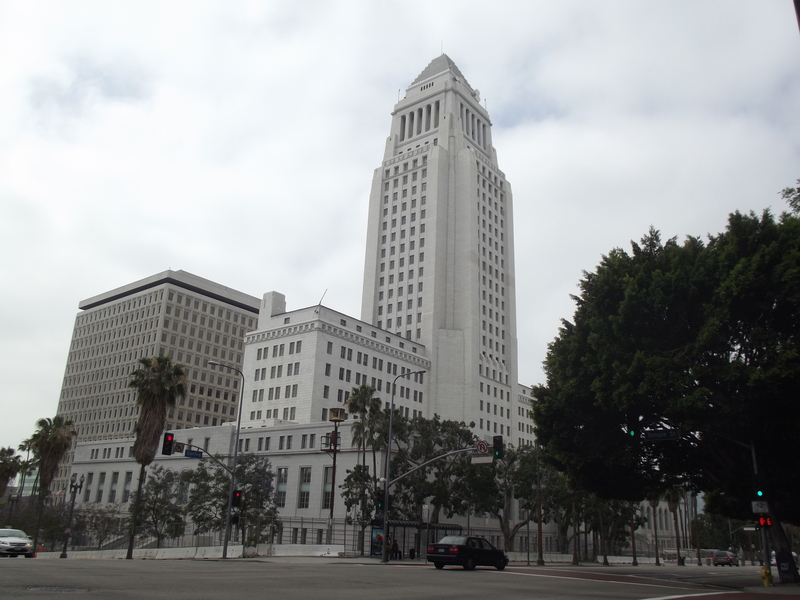 Next, I made my way towards the impressive City Hall building. There is a public park just south of City Hall filled with homeless people and their blue tarps. I saw one man sitting on a bench, his 20 CVS plastic bags hovering at his feet. Since it was about 10 a.m. and still cloudy, I used the coolness to walk uphill (Downtwon L.A. is pretty hilly and all the main skyscrapers are on the crest of the hill). 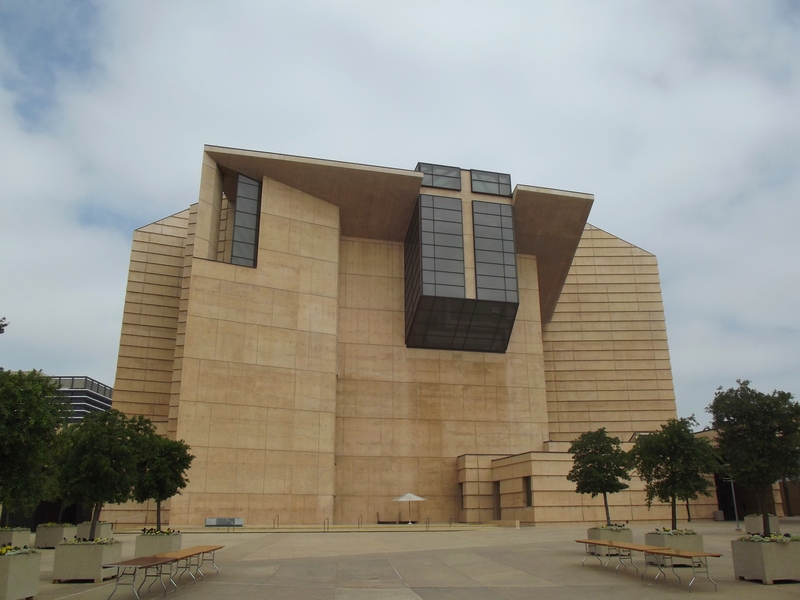 I visited the fantastic 10-year-old Catholic Cathedral of Our Lady of the Angels, a modern architectural wonder that includes no right angles, giving it an aura of mystery and majesty, according to its website. As I walked inside, I instinctively knew to take off my hat in such a hollowed place. The open sanctuary has a brown theme, with dark brown polished pews and walls of tan alabaster or marble, along with carvings of Jesus and the saints. I don’t have to be Catholic to enjoy this awe-inspiring cathedral (I’m a non-denominational Christian). It is great that this large proclamation of God and Jesus is so prominent in the city. 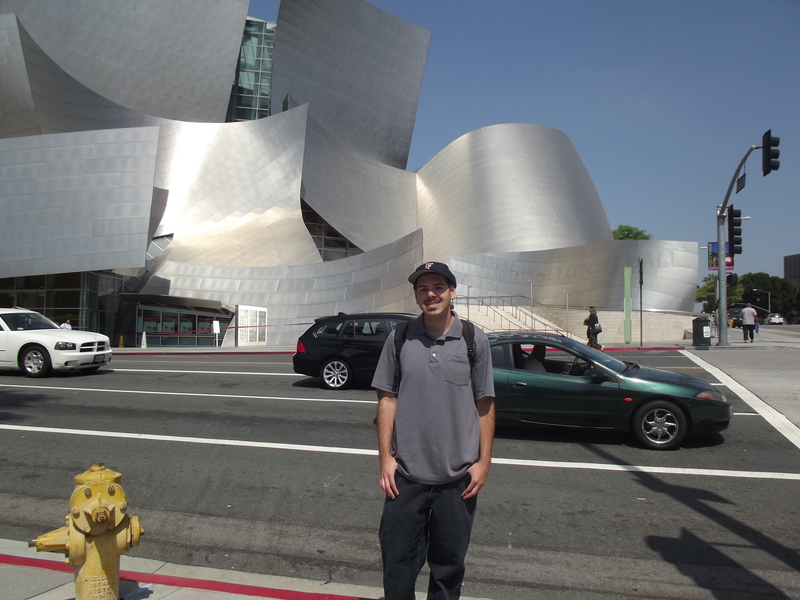 Next, I made my way two blocks west to the Walt Disney Concert Hall, my favorite sight in Downtown LA. 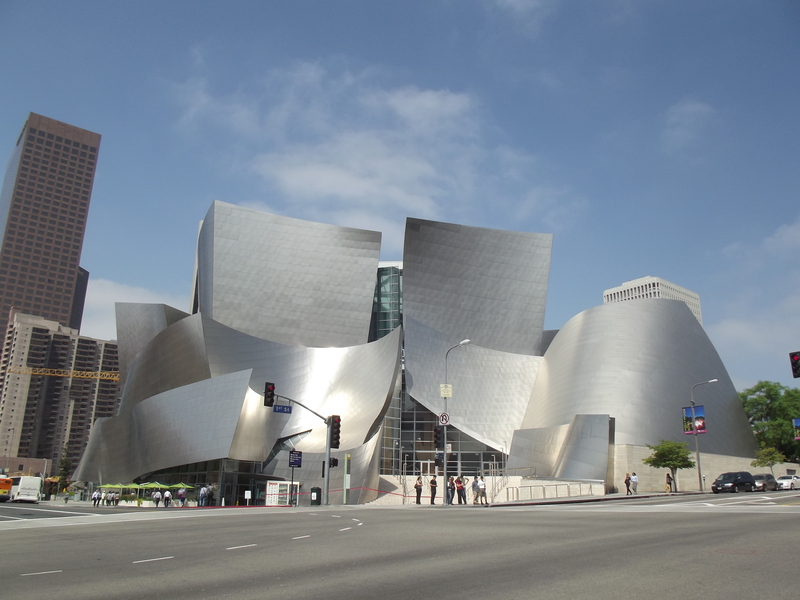 Interestingly, the Disney Hall and the LA Cathedral are both about ten years old and are both highly-esteemed architectural wonders that have transformed downtown into a more vibrant community. The smooth, flowing silver is quite a sight, especially on a sunny late-morning day. It also has a cool courtyard on the second floor. 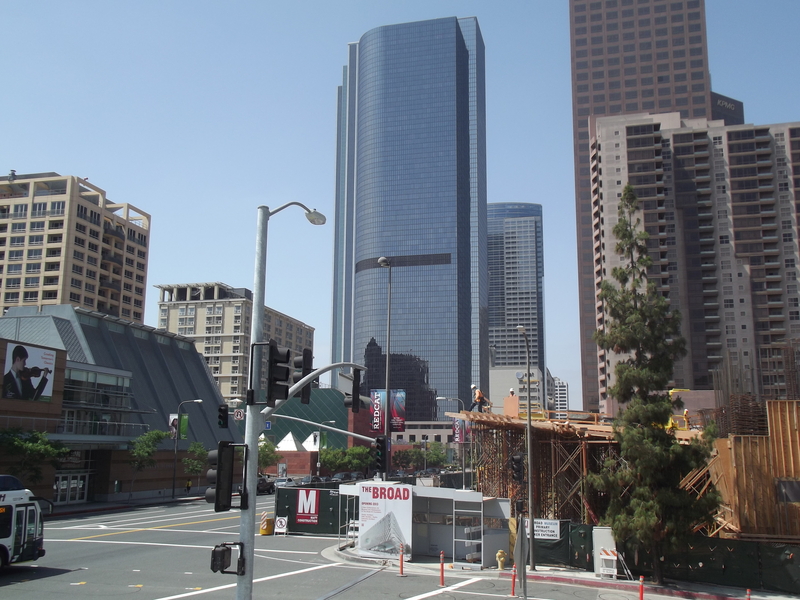 Continuing southwest on Grand Ave, I made my way to the California Plaza with the Bank of America and U.S. Bank skyscrapers nearby. The large courtyard has a pool and a great view south. Angels Knoll, right next to the plaza, is a great place to relax. 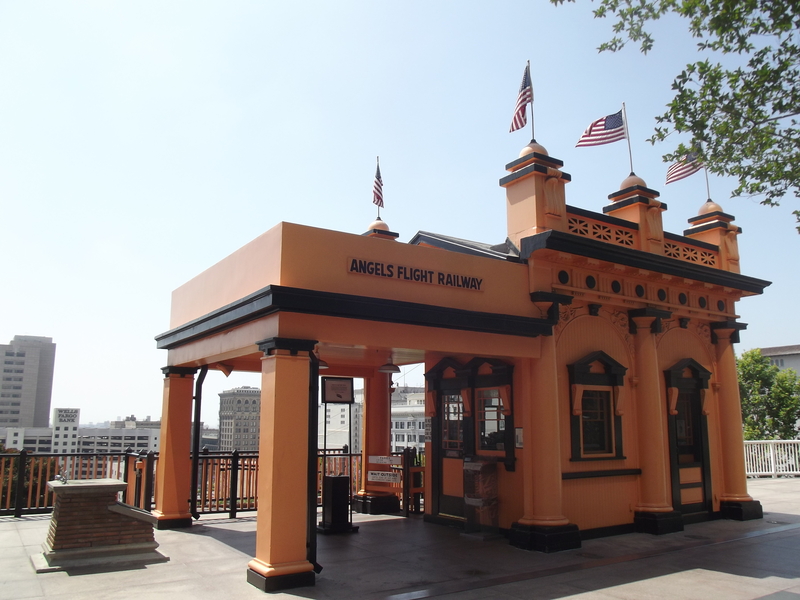 I should have taken the Angels Flight! The knoll is a cool, green park and a great escape from the rest of the city. 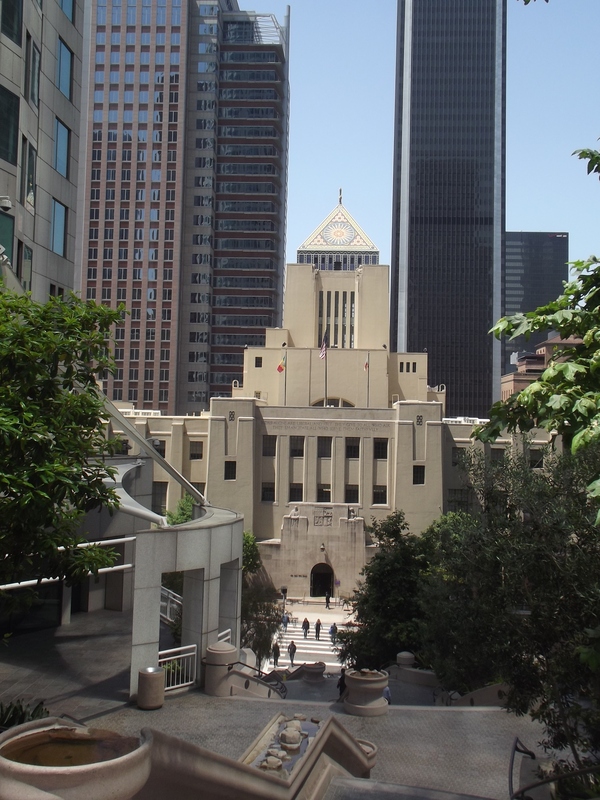 I then strolled over to the Los Angeles Central Public Library, an amazing six-story building with a rotunda! I love the iconography: the rotunda has statues of Plato, Dantes, David and St. John, stained-glass pictures of a sun and is topped with a hand holding a torch. 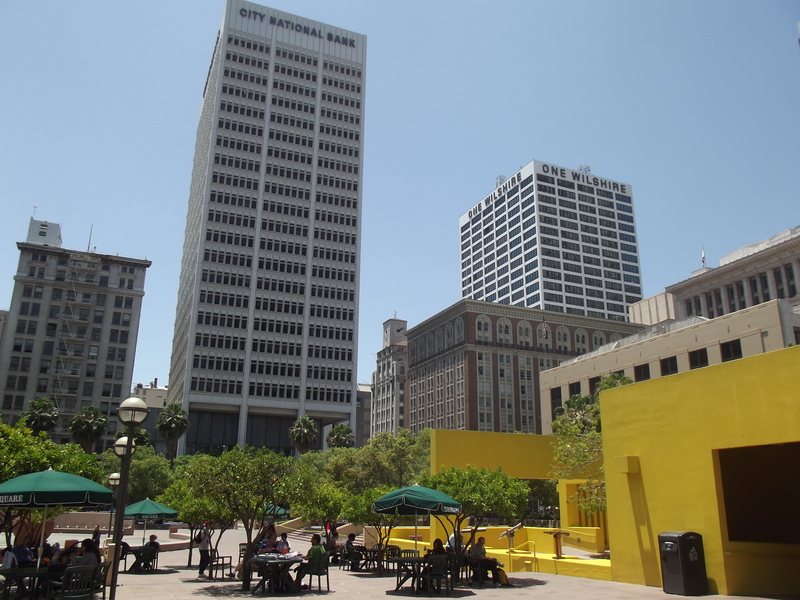 I then walked south to Pershing Square, which offers a great 360-degree views of the city’s skyline, and then met my friend Andy for lunch at a Pastrami shop next to where he works at the bustling 6th and Olive. I then headed south toward Broadway’s Skid Row, a poor area of town. All along Broadway are shops selling random stuff like shirts, CDs, old electronics, many of which with signs exclusively in Spanish. I even saw a few “Compromos Oro” (“We buy gold”) shops. Iwanted to check out The Last Bookstore, but I honestly didn’t see much there that I liked. Overall, I had a great day trekking across Los Angeles. I managed touring the city well for only having been there once and never having taken the Metrolink. Although, there’s only so much of LA I can handle at a time so I probably won’t be back soon- expect my next adventure to be somewhere more relaxing like the beach. The Broad Museum, right, undergoes construction on a sunny mid-morning in Los Angeles. The art museum plans to open in 2013. The sights: Skyscrapers, museums, a cathedral, a library, a park, public architecture, cars, busses, homeless people, businessmen and women, people taking pictures, food trucks, police cars, constructionsights, news vans, thrift shops. The sounds: Police car sirens, shouting, cars, busses, mariachi music, construction drills, people walking, people talking, quietness at Angels Knoll park, kids yelling and playing on a tour. P.S. The last time I visited LA, it was to visit Hollywood and see a live taping of a TV show. Read it here. 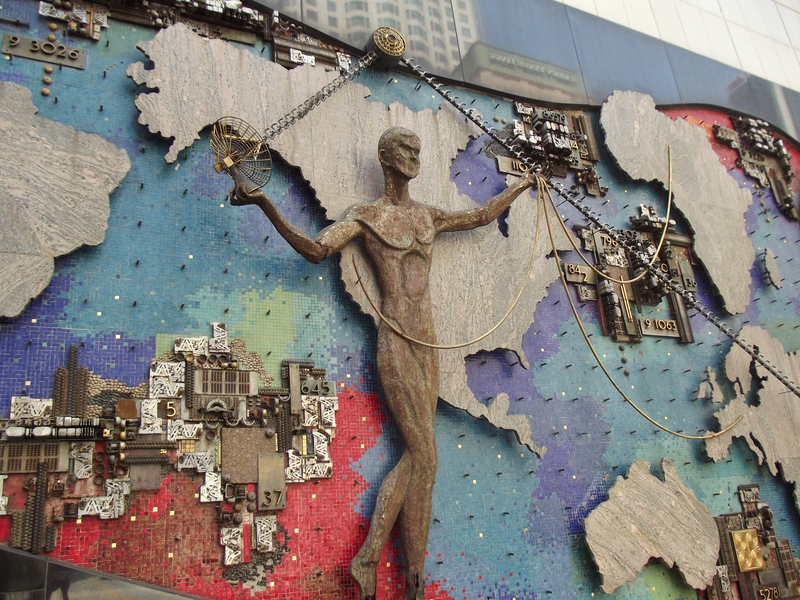 Interesting sculpture on the AT&T building around Olive and 5th streets.